The Latina Book Club wishes everyone a Happy Three Kings’ Day. We too remember our holidays in Puerto Rico, putting grass out for the camels, and awakening to boxes of little gifts. We also remember the mosquito bites, the sun burn and the tongue twisters when speaking Spanish to our cousins. But all that is part of our traditions and about family. The Latina Book Club is happy to have found a great book that showcases the best of the holidays and of family in THE CASE OF THE THREE KINGS: THE FLACA FILES by Alidis Vicente. This is book two in the Detective Flaca series but it stands alone. We know our readers will fall in love with Flaca and look forward to reading more of her adventures, and her books are bilingual so you can read them in English and Spanish. But first, let’s learn how Alidis spends her Three Kings’ Day. Q: Flaca learns of the Three Kings Day tradition on her trip to Puerto Rico. What do you remember from your childhood about the Three Kings? Where there any special rituals at your house? How do you keep this tradition alive? ALIDIS: We never celebrated the Three Kings holiday in my home, which is, in part, the inspiration for my book. I learned about the holiday from my cousins in Puerto Rico. They explained to me a lot about the celebration, the tradition, and the major impact it has on their holiday season. I felt slightly left out and wished I had grown up celebrating Three Kings Day the way my family did in Puerto Rico. It wasn't until a few years ago that I began to celebrate at home with my own children, so they could partake in the festivities. It's my hope to take them to Puerto Rico for Three Kings Day so we can experience the holiday together with our relatives for the first time. Until then, we'll be digging under the snow for grass in our winter gear! 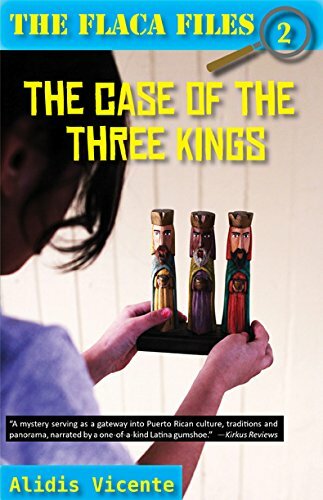 REVIEW: THE CASE OF THE THREE KINGS: THE FLACA FILES is an enchanting, fun tale about a precocious pre-teen with a nose for mysteries and a love for family. Readers will love Flaca and share her enjoyment in discovering the culture and traditions of Puerto Rico. ABOUT THE AUTHOR: Alidis Vicente is a mother of two from New Jersey. Currently, she is employed at a Montessori Preschool where she enjoys shaping the minds of young children. She is also a Rutgers University alumni who is returning to her alma mater as a graduate student in the Rutgers School of Social Work. Alidis, the original Detective Flaca, continues to write stories from her New Jersey home, only now she uses a laptop instead of a notepad… at least most of the time. Visit her at www.alidisvicente.com.